I don’t mind the one-and-a-half mile walk between the train and the office, but every once in a while I get the feeling that I’ll turn into a blancmange with a weak heart if I don’t do something more strenuous. With that in mind, I’ve begun riding my bike on a semi-regular basis. I don’t get very far, and I return on wobbly vermicelli legs with my whole family laughing at me as I gasp for water and collapse on the couch. But the effort is there. I’m not lazy – not in the least. It bothers me when people don’t get out and get moving. I’ve just never been an athlete. I’m tall and thin, and by rights I should be good at basketball or running or pole vaulting or something. It’s only fair. But I’ve been cursed with Three-Stooges clumsiness and bad knees. I only run if my kids are in danger or I smell really good food. My seventh grade gym teacher actually yelled at me for my skewed athleticism vs. height ratio. We were lined up in the gym to take turns shooting baskets. In my entire life, I’d never managed to get the ball in the stupid hoop; it certainly wasn’t going to happen while everyone was staring and the mean gym teacher was scowling at me. More than anything, I wanted that ball to go into that basket. I looked up at the hoop, squinted one eye to help my aim, and flung – yes, flung – the basketball into the air. It sailed wide and far under the net, bouncing across the gym. I was not about to chase it. “I can’t do it,” I mumbled, looking back at the line of classmates to take a mental tally of how many of them felt my pain and how many of them wanted to pummel me for my ineptitude. The split was not in my favor. “Just DO it!” he yelled, and not in a positive-reinforcement Nike sort of way, but in a way that meant that by sheer force of his will and the fact that my height put me several inches closer to the net than everyone else, I should end this pathetic display pronto. “I don’t feel very well,” I said. And it was true, not an excuse – I had come to school with a fever and chills that day. But I could have been blindfolded and standing on my head, and my aim wouldn’t have been any worse. “Why are you even here?” the world’s meanest gym teacher said, as more of an accusation than a question. Thank god my bad knees got me out of gym class for the rest of my school career. When my oldest child was born, I was determined that she should get an early start at sports. She tried karate for a few weeks, but it made her nervous. Soccer was fun, but she really wasn’t concerned about winning, which irked the other players. She tried cross country and ran like the wind until it came time for the actual meets, when she decided she’d rather run for fun. She briefly excelled at a course in fencing – not in the Olympic sense, but more in the sense of saving herself from imaginary pirates. Maybe we’re just not competitive folk when it comes to sports – academics, yes, but not sports. We are mathletes, not athletes. When my youngest turned two, I took a different tack. He wanted to take dance. It was movement, it was a group activity – didn’t that essentially make it a sport? We joined a Mom & Me dance class, and let’s just say that it was the beginning of his career frightening girls. Surrounded by petite pixies in tiny pink tutus, he spun around like a drunk Fred Astaire. The mini ballerinas followed the teacher’s directions to the letter, while he freestyled, squealing, “I love dance!” He wanted to dance with the girls, not stand in a kick-line next to them, all doing the same thing. But no one wanted to stand next to him; no one wanted to be his partner. He’s three now and his favorite song to dance to is a composition of his own entitled “Shack Black the Monkey is Red.” It’s no wonder the girls are scared. So genetically we’re a family of pasty, uncoordinated wimps with questionable dance moves. We’re terrible at sports, but at least my kids are active. They bike, they scooter – and I swear no one walks as much as we do. I can’t count the number of times we’ve worn out our out-of-town visitors after saying, “You’ll never get a parking space on the waterfront. Leave the car in our driveway and we’ll walk.” or “Of course you can walk from Faneuil Hall to Copley Square. We’ll be there in no time!” We probably won’t win any races, but I don’t think we’ll be turning into blancmanges any time soon. The first movie that I remember being terrified by was Jaws. Everyone was scared of sharks the summer Jaws came out – even the poster was eerie – but I was terrified at the molecular level. I blame my parents and the Kingston Drive-In. Of course, it doesn’t help that we live in Massachusetts, not far from where the movie was set, where I was sure there was a family of Great Whites swimming around looking to seek revenge on Chief Brody. (Did you see Jaws 2? I wasn’t far off.) It doesn’t help that I saw the movie from the back of my parents’ ’68 Mustang (where I was supposed to have fallen asleep after the Jungle Book), peeking over the seats and ducking back down every time the scary music started up again and my mother yelled “Shark!” Even the grey metal speakers that clipped to the car window terrified me that night, their grills like shark mouths piping the scary John Williams theme. I tried to convince my parents that we didn’t need the speakers and could hear the sound just fine from other people’s cars. My most vivid memory of the movie is not even of the shark itself, but of a corner of a kitchen table – the scene where Chief Brody and Hooper drink wine and talk shark, which I watched with both eyes open because it took place solidly on dry land. Still, sometimes it’s what you don’t see that’s most terrifying. Hearing the music from the silver-grey squawking speaker perched inside the car window, knowing the shark was coming to eat someone (heck, it could have been me! ), my mother telling me when to duck back down behind the seats – all of these added up to the most terrifying movie experience I ever had. Did I mention that I was only five years old? As far as I knew, that shark could have been in the parking lot, circling our car, just waiting to swallow the entire Mustang whole. So, I don’t think I was being unreasonable to protest learning to swim that summer. True, a child who lives near the water should know how to swim. But perhaps it was not my parents’ best idea to sign me up for swimming lessons IN THE OCEAN. In open water. Where I was sure sharks would eat me. The lessons were held at Priscilla Beach, and they were never on a sunny day. It was always overcast and spooky, and because it was early in the morning, the fog had never quite burned off. Our teacher was non-descript other than her obvious fear of sharks. She cloaked her fear in meanness, but I could tell she was scanning the horizon for telltale signs of dorsal fins. She held a clipboard with our names on it clutched tightly to her chest, and she never went deeper into the water than mid-shin. In fact, not only did she insist on always being the one closest to dry land, shooing the rest of us further out into the deep – she finally gave up on swimwear altogether and just wore shorts and a sweatshirt to the lessons. Because she refused to go into the water, there wasn’t that much she could teach us. Earning our end-of-course badge was based entirely on our mastery of one skill: ironically, the dead man’s float. I can therefore credit Steven Spielberg with two things in my life: my fear of swimming in open water, and my love of drive-in movies. Despite the terror, watching Jaws at the drive-in was an experience beyond sitting in safety inside a theater. I wore my pajamas at the rusty playground and got salty Styrofoam popcorn at the snack bar. Instead of rows of people, the boisterous snack-filled cars held mini-parties – tiny microcosms of society that stopped to cross paths for a couple hours’ entertainment. We (my husband and I) have actually tried to recreate this scenario in our own back yard, in the most literal of ways. We don’t have a rusty playground, and we don’t let people drive on the grass, but on every nice weekend night, we hang a giant movie screen on the back of our house for “Drive-in Movie Night”. It started with a 16mm projector, a few reels and a few friends, and has grown into a little weekend carnival of its own. (Investing in a carnival-style popcorn popper certainly helped.) Last year we added a preview reel to our repertoire, featuring animated Drive-In ads from the 50s and 60s in which shiny dancing hot dogs implore guests to buy snacks before the show. Sometimes we’ll plan a movie night with invitations and 80+ people, but most often it’s impromptu –say, a last-minute showing of “The Fog” on a foggy night. The kids huddle in their blankets, sticky with cotton candy, while the grown-ups sit back with a few beers. Without fail, though, every July 3rd we show Jaws… and on July 4th we’re all afraid to go back in the water. When my father passed away, my mother asked if there was anything of his that I wanted to keep. Anything at all. She had her memories, she said, and anything I wanted I could take from the house and keep. My dad was a simple man – not flashy, not wooed by material things. He was highly educated, a medical professional, yet he wouldn’t use a computer. He refused to own a cell phone until he became sick and I bought him one in case of emergencies; most of the time it was turned off, and he never did learn how to check his voice mail. “When I am Emperor…” he used to say, and this was usually followed by “People will be arrested for talking on cell phones while they drive” or “Everyone will have to take a year of Greek and Latin”. After some consideration, I told my mother that I’d like two things: his wedding ring and his pocket knife. If I had his ring, I’d always have him with me, and would take him on my travels to places he’d never been. Fate had dealt my parents a dirty hand by timing cancer perfectly with retirement, cutting their plans short. And the pocket knife was a little thing, but a perpetual memory of childhood. Any loose thread, envelope, piece of packing tape, or loose screw was met in a flash with the tiny silver blade; unfortunately, it was lost on a hospital trip when he was too sick to realize it was falling out of his pocket. The ring, a plain, wide, white gold band with their initials carved inside, became mine. If there was one thing my father taught me, it was that life experience is more important than material things. People need less stuff, not more. As kids, my sister and I never owned anything with a brand name on it. We possessed exactly one non-hand-me-down Barbie each (okay, my sister had two). We got one Merlin* for Christmas, and had to share it without fighting. But we went to plays and concerts and museums and historical places. I learned early that my parents would take me out late without my sister if I sat quietly for long periods of time, and I used that trick to my advantage. By the age of eight I had seen Arthur Fiedler, Seiji Ozawa, Zero Mostel, and more summer stock versions of great musicals than I can count. I’ve tried to follow this philosophy with my own kids. Granted, they have video games, but my 12-year-old is a well-traveled art junkie and a frequent “date” of various older relatives for concerts and plays. With Easter rolling around, a recent dinner with friends turned to the topic of Easter baskets the purchases they entailed. Word on the street was that baskets these days were being filled with not just video games but video game systems. Easter was becoming another Christmas, and the adults in this particular dinner discussion were not willing to keep up – myself included. When my oldest was a toddler, I was a single parent. I’d put cute but practical doo-dads in her basket, then hide a dozen candy-filled eggs around the house. When she wasn’t looking, I’d take one or two back out of her basket and re-hide them, so she thought she was searching all day. This year, my youngest is getting a basketful of cheap Ikea – among other things, some new plates and cups for eating outside with his friends. And my oldest, well, she’s getting life experience. In her Easter basket, camouflaged among embarrassing pre-teen necessities like fluoride and moisturizer to throw her off the trail, are the heads of Bono, The Edge, Adam, and Larry inside plastic eggs. Yes, I’m breaking my No Concerts On School Nights rule to take her to see U2 at Gillette Stadium. Of course, as a lifelong U2 fan, I can’t deny that I’m thrilled to be going; but at this stage of the game, the fun comes in sharing these things with her. She’s been to Symphony Hall, to the Paradise, to the Garden, and to Tanglewood – for all genres of music – but this will be her first stadium concert, for a band she loves. I think that my dad – who once broke the No Concerts On School Nights rule so that I could see David Bowie in the same venue – would agree. Brand names emblazoned on people’s backsides. My cousin and I, there this month for vacation, didn’t notice it right away. What we noticed first was the posture of the cyclists, sitting cheerfully astride their Pee-Wee Herman-style bikes. No fancy sport bikes here; everything clangs and clatters, with children riding either in baskets on the front or in seats on the back. So I suppose we first noticed that the Dutch didn’t seemed overly concerned about brands of bikes – which makes sense considering the amount of time they’re spent parked in the rain. They look fabulously smartly put together, and (she says with a twinge of jealousy) they look as if they don’t care how they look. 1. If she’s ever going to try dope, she’s not going to get arrested, and she can at least have very excellent coffee along with it. 3. Those mean girls in her school with the “Juicy” sweatpants? Gone. For this (and the stroopwafels), I could learn to parallel park alongside a canal with no railing. 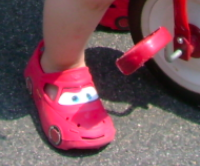 I’ll admit that, in the past, I’ve caved in to those big blue eyes staring up at me from the seat of the Target shopping cart and been coerced into buying Thomas the Tank Engine sneakers or Lightning McQueen sandals. “But he loooooves Thomas!” I’d say to my husband upon returning home, pointing at the grinning blonde toddler stomping around the kitchen in his new kicks, holding a train in each hand as he stared at his own wobbly feet. Surely such a display of cuteness must justify my impulse purchase. But Spiderman? He has never watched Spiderman, we don’t have the comic books – he might as well be asking for Walter Mondale shoes. “Do they have anything cool?” he asked, frowning skeptically at his plain black sneakers. “Probably not. And what’s with the ‘cool’ thing, anyway?” Truly, this was a new development. Superheroes, I was told by this most diminutive of experts, are cool – as are monster trucks. He found this out from his friends at preschool, and although he was unable to define that certain quality that made them cool vs. uncool, he was able to tell me that Wolverine was the one with claws. And therein lies the rub. It wasn’t that he, too, needed superhero shoes; it was that he needed something different – cars, stripes, seizure-inducing flashing lights – anything that would make his shoes unique. It’s the same reason he insists on wearing a hat with a propeller on top or speaking only in “Penguin”. (Penguins, apparently, have a vocabulary limited to words such as “bloorp bloorp”, yet possess a wide range of expressive hand signals despite the limits of their flippers.) Even preschoolers need to make their mark on the world, and their world exists in a land of make-believe far bigger than our own. Perhaps brand loyalty begins too young, and Spiderman shoes become Adidas pants and Abercrombie sweatshirts – but perhaps it’s more than that. Maybe we’re pre-programmed to make our mark on the world in some unique way and to say, from the height of three feet tall, “This Is Me” – and only later become tempted to follow the crowd. With a sigh, he agreed to try on a sensible pair of brown shoes, surprised at their inner squishiness. “Are they comfortable?” the salesgirl asked. “YES!” he squealed, then caught himself. “I mean... nooo….” Lifting his foot and turning over the shoe, I showed him where the squishiness came from: a clear rubbery plastic air bubble built into the sole, from which you could look straight through almost to his socks. The feature was purely practical, but I could see the wheels spinning. He decided to wear them home, where his grandmother was waiting for us. Each year, Fall does fewer things to endear itself to me. In fact, I think it goes out of its way to make me hate it more and more. This year, my least favorite season leached out of its boundaries into August and well past December. Fall, I shake my fist at you and the grimness you bring. Suffice it to say, I didn't feel much like "blogging", and now I need a vacation. Enter my cousin Gretchen and her plane tickets. "Cousin," she said to me, "We need to go somewhere funny. Somewhere we'll laugh hysterically." "Like that time in Florence when the pigeon crapped on your head? That made me laugh pretty hard" I said. And truthfully, it was one of the funniest things that happened on our trip to Italy last year. We had just descended over 100 stairs from the top floor of the medieval villa where we were renting a room. Stopping at the bank machine, I looked up and saw the fluffy wagging nether-regions of a windowsill full of fat Tuscan pigeons. Backing away just in time, I almost heard the "splootch!" as Gretchen screamed and was hit. My first thought was that I didn't think I could climb those stairs again, so I whipped a Wet Nap out of my purse and began dabbing furiously at the glob on her scalp. "I need a shampooooo!" she wailed. "But cousin, I have a Wet Nap right here!" the mother in me said consolingly while dab-dab-dabbing. I now know, for future reference, that pigeon poop plus Wet Nap equals a very sturdy glue. And so, up the 100+ stairs we went, gasping like a couple of old smokers (we're not), laughing so hard I almost ralphed over the railing. And that place is Amsterdam [insert jokes about dope and hookers here]. There are stroopwafels! There's a store with 200 kinds of cheese! There are museums and houseboats and canals and all of them are not here. That's good enough for me. I have an aqua polka-dot suitcase, and I am leaving all my work at home. My parents were masters of the Cheap Family Vacation. So expert were they, that my sister and I really thought there was no one else who was having as much fun as we were. Our vacations were always to Washington DC (stayed with family) or Quebec City (cheap Canadian dollar), and we always drove (never flew) but still - we fancied ourselves well-traveled. Except when it came to Disney World. Everyone else on the planet, it seemed, went to Disney World. We begged, we pleaded, we promised to be sooooo good forever and never fight with each other ever again ever if we could just go to Disney World like everyone else. "Disney World is expensive," my mother said. "We'd have to save up for a few years." "Sure, we can go to Disney," my father said, and for about two seconds my sister and I sucked in our breath as if this was the moment we were waiting for, although deep down we knew there'd be a catch. "But that means no more Quebec City." My sister and I looked at each other and knew that we wouldn't even need to discuss this one to agree on a decision. No dice. I, for one, spent 51 unbearably long weeks every year waiting to go to Quebec City. No six-foot-tall helium-voiced mouse was going to take it away from me now. Quebec City has no roller coasters, no big subways, no beaches. But it's Disney in its own way - a tiny jewel-box town where jugglers dance in the streets, painters work on miniature masterpieces at easels on the sidewalk, and musicians spontaneously break out in song wherever there's a blank patch of grass for a stage. 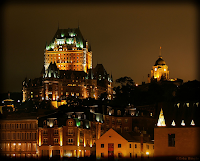 There's no skyline, so the Chateau Frontenac rises like a castle surrounded by the 18th century dollhouses. The kids down the street who went to Disney World used to ask us what we did in Quebec City. You know, since there's no Space Mountain. Well, in Quebec City, we didn't stay in a hotel; we stayed in a little basement apartment with a bed in the kitchen and a door that opened onto the sidewalk so that when we heard concerts starting in the park, we could walk right out in our pajamas. We ate croissants for breakfast and watched our crepes being made for dinner - huge tabletop-sized wafer-thin pancakes, filled with ice cream and folded like origami until they fit on our plates. We played on the big cannons on the boardwalk. We watched my father buy any combination of items at a newsstand that might add up to seventy cents just so he could say "Soixante-dix?" to the vendor. We rode the Funiculaire, a rickety outdoor elevator, from the upper town to the lower town, each time feeling that at any minute the cords would snap and we would crash to the bottom. We took the ferry across the St. Lawrence to Levis, just to see the view of Quebec from there - truly the cheapest fun to be had, because it was really just a commuter boat, like taking a bus, and the best part of all was that we could buy salt and vinegar potato chips on board, long before they were available in the US. The Disney kids didn't quite get it. You know, since there's no Space Mountain. But Quebec wasn't a place where you even had to do things to keep busy. The place just is, and when you're there, you are too. It's life experience. So I've still never been to Disney World, and neither have my kids. Yet. (We'll go someday, so that they don't reach adulthood with that nagging feeling that they're missing something like keys or a wallet.) But a couple years ago, my parents took my daughter on her first trip to Quebec City, just the three of them, and they did all the same things we used to do. She brought home a tiny glass snow globe of the Chateau Frontenac, the one gift she wanted as a souvenir. It sits on our mantle, the jewel-box city in miniature. If someone asked me right now to hop on a plane and choose Quebec City or Disney World, I have a pretty good idea of which one I'd pick. © 2009. Unauthorized use and/or duplication of this material without express and written permission from this blog’s author and/or owner is strictly prohibited. Excerpts and links may be used, provided that full and clear credit is given to the author with appropriate and specific direction to the original content.